BeerBasics.com “In the Kitchen” pickled up beer-pickled red onions and beer-pickled cucumbers in the first part of this video. The resulting beer-pickled cucumbers and onions were remarkably different from traditionally pickled cucumbers and onions. The additional flavors of sweet malt and a touch of hops accentuates the herbs and spices we used, especially with the pickled onions. BeerBasics.com is glad you chose to visit with us “In the Kitchen” for a look at how to make beer-pickled cucumbers and beer-pickled red onions. The basic choice of what you want to pickle is not limited to cucumbers and onions. Click on the above picture to view the video. 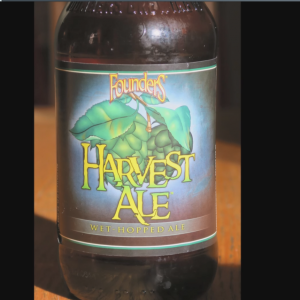 The good folks at Founders Brewing Co. sent me this sample of their seasonal brew. On 12 October 2018, on a trip through New Hampshire, I stopped in Portsmouth, NH and dropped at Liars Bench Brewing Co. for a chat, and a sip or two. Once again, BeerBasics ventures to the Henry Street Ale House in Brooklyn Heights, to do a special “Back of The Fridge” Tasting Notes. This time it is a six-year-old beer from the Grand Teton Brewing Co. in Victor, Idaho. 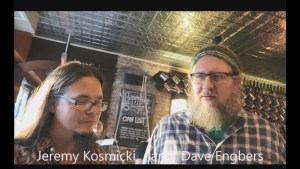 BeerBasics.com is glad you chose to watch this interview with the co-founder of Founders Brewing Co., Dave Engbers, and Brewmaster, Jeremy Komicki. BeerBasics Revisits Great Rhythm Brewing Co.
BeerBasics.com is glad you chose to watch BeerBasics.com revisit Great Rhythm brewery in Portsmouth, NH.